Our place is a ground floor efficiency unit facing the large pool. The ocean is directly across the street. We have a flashing light pedestrian crosswalk in front of our building for direct ocean access. Even though we are sound side, we are located at the narrowest part of the island where 1 row of sound side cottages meet 1 row of beach front cottages with the main road running in between. Our private walkway puts you right on the beach in a matter of a few steps. We also own the unit next door...just steps away! This unit (VRBO #360453) is also ground floor-pool facing so if you need more space this offers the perfect solution. Both units have a King Size bed plus a double size sleeper sofa. 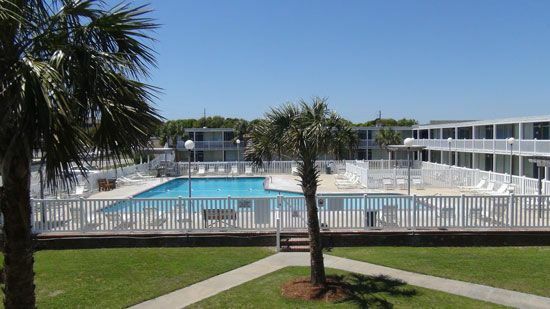 We're located at Bogue Shores Condominiums which is well known for its family friendly atmosphere. We are close to everything. While the unit is most comfortable for 2 adults, it is possible to sleep four (4) if you have 2 small children and your kids don't mind sleeping on the fold out sofa. We cannot accept rentals for 4 adults. If you picture a typical older style 2 level "U" shaped hotel where the rooms have been converted into a condominium with the addition of a small kitchenette at one end then you'll get a good visual of our room. The fully stocked kitchenette and bathroom are both small but we've found to be fully functional for our family. We have a large adult pool and a separate kiddie pool (w/ new enclosure around baby pool to keep little ones safe). You can also bring your boat! For a nominal fee of $20 you can have access to our boat launching ramp and boat parking for your entire stay. You will have to bring your boat out of the water at night since the boat slips are reserved for owners only. We also have a floating pier for easy jet ski docking. On the sound side, we have a pier where we love to fish! - Renters agree to clean, dry and put away all dirty dishes and take the trash out. Renters will pay a cleaning fee. - No more than 4 people in unit (preferably max of 2 adults plus 2 children). No exceptions. Please feel free to give us a call anytime or click "contact owner" button to ask any questions by e-mail. We are a family of four from Greenville, NC who loves the beach. The family friendly atmosphere, the proximity to the beach, the large pool and beauty of the sound side! There are always children for our kids to swim and play with when we go to the beach. The property is located at a very narrow part of the island. As a result, while the property is on the sound side, it is also street side and once you cross the street you are ocean front. You can see the ocean from the 2nd floor of building. You have a great view of the sound as the property sits sound side. Small table with 2 chairs and if you pull out you could accommodate 4 to eat. It is very small but we do it regularly with our family of 4. Cindy and her family have a great location for a getaway and close to everything. Would definitely like to stay again when in the area! We enjoyed our stay. The unit was clean and well maintained. My first experience with VRBO and it was all positive. We received clear instructions prior to our visit. Everything went smoothly with no surprises. I'd certainly recommend this unit to anyone looking for an affordable place to stay in Atlantic Beach. Thank you. Great room! Super comfy bed and had perfect amenities for cooking. We were in town for hurricane Florence clean up; thank you so much for being open to renters! This place is great. It is tiny but it is everything you need for an affordable vacay to the beach. clean, seemed very safe property, and beautiful pool. Love the room, love the place, love the view of the sound. Not much for words, but absolute loved our vacation and would rent recommend this room to anyone. Some of the things we love to do...Charter boats to go deep sea fishing, fish off fishing piers, eating out at local restaurants, visit NC Aquarium, go shopping, visit historic Beaufort, Cape Lookout, & Fort Macon State Park, mini golf, bumper cars and rent jet skis. Other things available on our list to do...golf at a local golf course, Sailing & Kayaking, Boat Tours, Cruises, Diving, Ecology Tours, , The History Place and the Core Sound Waterfowl Museum, NC Seafood Festival, Atlantic Beach King Makerel Tournament, Wild Horse on Shackleford Banks and Carrot Island, Summer Concerts at Fort Macon, Great Dining, Visit Blackbeard's house in Beaufort. Labor Day, Memorial Day and Seafood Festival weekends have a three night minimum. Renters clean room. Lock box on door. Instructions provided via e-mail.